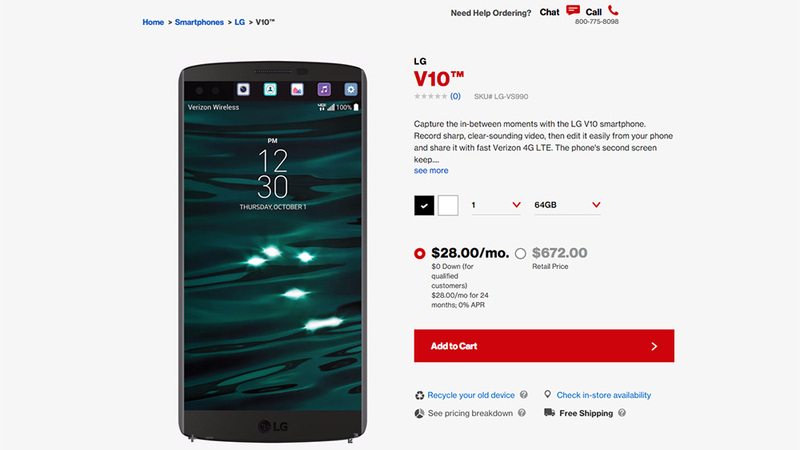 After going on sale earlier in the week at AT&T and T-Mobile, the LG V10 is now available from Verizon. The mega-phone comes in two colors, white or black, and starts at $28 per month with a payment plan or can be grabbed at full retail for $672. As a recap, the V10 is the first in a new line of premium phones from LG. The phone has a 5.7-inch QHD display, secondary ticker-like display, 16MP rear camera with OIS, Snapdragon 808 processor, 3000mAh battery (removable), and 64GB of storage (with micro SD support). It also has steel pillars running up its sides to add to durability, and a Dura Guard protection around the rest of its body. It’s a beast of a phone, yet is somehow almost elegantly designed. Man, there are a lot of good phones out right now to choose from. Is this the one that grabbed your attention?